The Indian state of Meghalaya experiences some of the highest levels of rainfall on Earth. 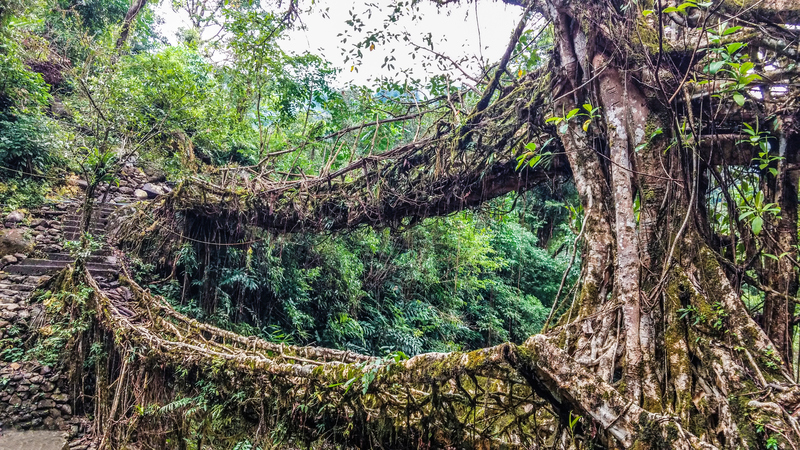 Floods could cut off villages during the monsoon season, but the indigenous Khasi people use the roots of the rubber tree (Ficus elastica) to create so-called “living bridges” to allow crossings throughout the year. Plans for a green ‘forest city’ that will help to fight pollution are about to become a reality as construction begins on an innovative new project in southern China. The Liuzhou Forest City … is the first ever city of its kind as it will produce 900 tonnes of oxygen and help absorb almost 10,000 tonnes of carbon dioxide and 57 tonnes of pollutants every year. The term Wood Wide Web has come to describe the complex mass of interactions between trees and their microbial counterparts underneath the soil. Spend enough time among trees and you may get a sense that they have been around for centuries, standing tall and sturdy, self-sufficient and independent. But anchoring trees and forestry everywhere, and therefore enjoining them into an almost singular superorganism, is a very intimate relationship between their roots and microbes called mycorrhizal fungi. Trees, Forests, stuff related to or similar to that.That’s the topic.